easy-to-follow guidance on how to remediate these cyber gaps. Your responses are saved so you don’t need to respond to the same questions for each upstream partner. Discover the assets belonging to your business, and their cyber-gaps. 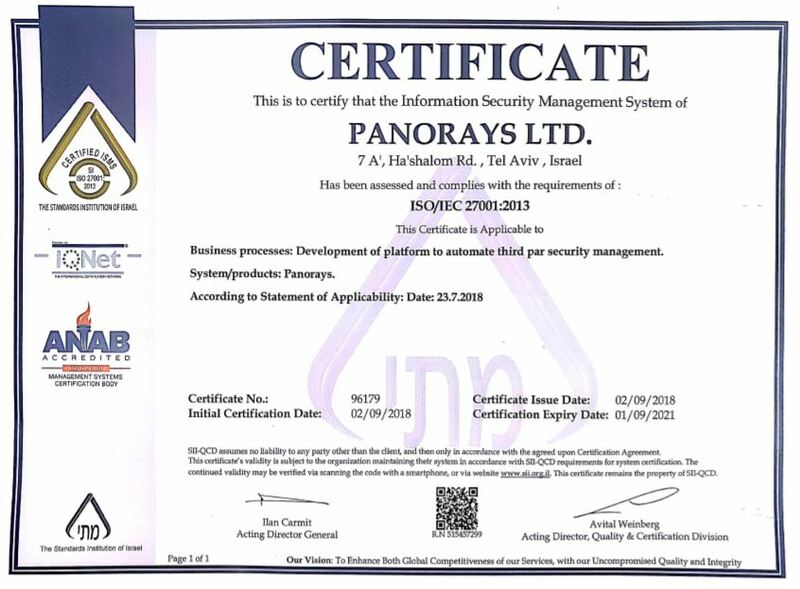 There’s no need to be a security wizard – the Panorays platform details the ﬁndings and the security jargon so you gain an understanding of your security posture. Receive guided how-to’s on ﬁxing issues. Findings are prioritized so you know where to put the emphasis ﬁrst. Once ﬁxed, receive near real-time notiﬁcations reﬂecting the change in your security rating. Your upstream partner will also automatically know of the rating increase. You shouldn’t be spending time answering questionnaires. Again. Store the responses for your questionnaires in the Panorays platform. simply share your stored responses. Share your security profile with other upstream partners. When you’re asked to undergo an assessment or fill in a questionnaire, pass along the link to your stored responses. Better yet, provide in advance the link to your already-created security profile to shorten the sales cycles. and share your proﬁle with your upstream partner.